level of the troops is lower. The strategy stays the same. Destroy the black Walls on both sides. Deploy 30 Barbarians per side to destroy the Air Defenses. Do this in waves. Add extra Barbarians and archers to destroy the Wizard Towers. 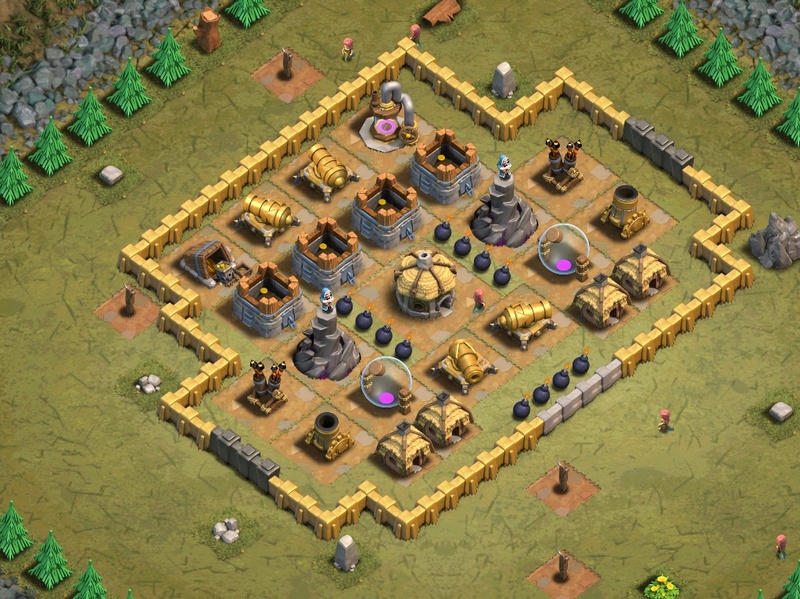 Deploy 10-15 Giants followed up by Wall Breakers on the right side, near the Level 4 Walls. Let them destroy the Air Defense, then deploy a Healer or two. As the Giants work through the base deploy about 6-10 Balloons to clear out the other Air Defense and other remaining anti-air towers. Afterwards simply use any necessary clean up troops if you want to speed up the destruction, as the lack of anti-air defenses afterwards mean that any surviving Balloons will not be able to be stopped. Or plop 3 Lightning Spells at the right Air Defense, then deploy a few Balloons to defeat the other one. Use Minions or Dragons to take care of the rest.